Made his debut with Efes Pilsen Istanbul during the 1994-95 season. Signed for the 1999-00 season by New York Knicks. Signed on early February by Milwaukee Bucks for the remainder of the season. Back to Turkey for the 2000-01 season, signed by Efes Pilsen Istanbul. On January ‘01 moved to France signed for the remainder of the season by Paris Basket Racing. Moved to Russia for the 2001-02 season, signed by CSKA Moscow. Moved to Italy for the 2002-03 season, signed by Mens Sana Basket Siena. Moved back to Russia for the 2003-04 season, signed by CSKA Moscow. Moved to Turkey for the 2005-06 season, signed by Ulker Sports Club Istanbul. 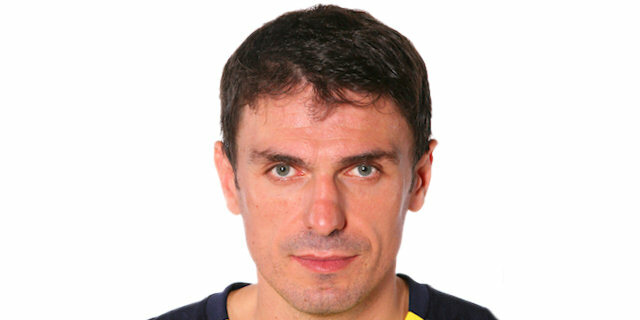 Signed for the 2006-07 season by Fenerbahce Ulker Sports Club Istanbul. 2017 - Named Euroleague Basketball Legend. Named the 2001-02 Euroleague Regular Season MVP. Named the 2002-03 Euroleague Top 16 MVP. Named to the 2001-02 and 2002-03 All-Euroleague Second Team. Named the 2001-02 Euroleague Week-5, 10, 12 and 20 MVP. Named the 2002-03 Euroleague Week-4, 8, 10, 14, 15 and 20 MVP. Played at the 1995, 1997, 1999 and 2005 European Championships. Won the 1995-96 and 1996-97 Turkish National Championship with Efes Pilsen Istanbul. Won the 2003-04 Russian National Championship with CSKA Moscow. Won the 2006-07, 2007-08, 2009-10 and 2010-11 Turkish National Championship with Fenerbahce Ulker Sports Club Istanbul. Won the 1996 and 1997 Turkish National Cup with Efes Pilsen Istanbul. Won the 2010 and 2011 Turkish National Cup with Fenerbahce Ulker Sports Club Istanbul. Won the 1995 Turkish President Cup with Efes Pilsen Istanbul. Led the 2001-02 Euroleague in rebounding (13.9 rpg.). Led the 2002-03 Euroleague in rebounding (12.2 rpg.). Led the 2010-11 Euroleague in rebounding (7.33 rpg.). Led the 2002-03 Italian League in rebounding (10.7 rpg.). Led the 2004-05 Russian League in rebounding (11.0 rpg.). Has been member of the Turkish U-18 and U-22 National Team.